Discover the "elevated rocks" of Meteora, explore the eerie natural landmark and dive into Meteora's religiosity and sanctity. Round off your day by experiencing the mesmerizing sunset at the place between Heaven and Earth. Engage in a lifetime travel experience and visit Meteora, a land in the clouds, protected by UNESCO as a 'World Heritage Site'. Marvel at the lofty rock formations creating an eerie scenery, explore the monastic region with the help of our expert local guide and dive into the humbling spirituality and awe-inspiring sanctity of Meteora. Round off your day by enjoying the sunset at one of the most iconic locations of Greece! Set on a 4-hour private Meteora tour with our knowledgeable local guide. See all 6 ancient monasteries located on top of the rock pillars of Meteora and a visit to at least one of them. Enjoy a spectacular sunset at Meteora surrounded by phenomenal scenery. 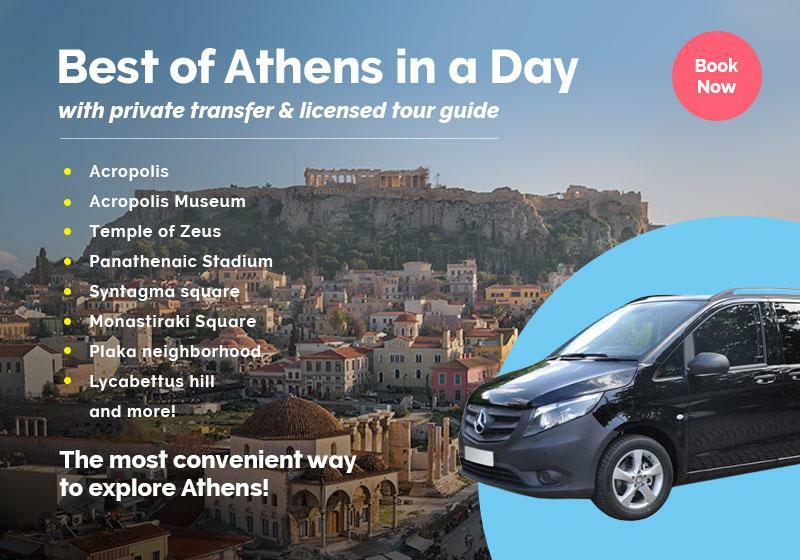 Pick up from your hotel or Kalambaka’s train station with a luxurious vehicle and drop off at your hotel. Nikos arranged an amazing Meteora tour for me and my family! Thank you so much for creating memories of a lifetime! What an experience! We are so glad to have discovered Greeking.me and their amazing Meteora tour by sunset. This was the highlight of out 10day trip to your amazing country. We will be back for sure! Start your tour by exploring the region of Meteora. Your guide will provide you with information on this unique geological phenomenon and introduce you to the history of the region. The area has been inhabited since prehistoric times and hosted early humans in its numerous caves, protecting them from nature’s elements. Learn about the cave of Theopetra, one of the most important sites worldwide regarding human evolution and find out how the region became the pivotal monastic center it is today. Get a tour around all sacred, Byzantine monasteries hundreds of years old, and witness Byzantine architecture at its finest. The monasteries of Meteora host some of the most valuable artifacts of Byzantine times and are decorated by elaborate frescoes, reflecting the spirituality of the Greek-orthodox Church and now you have the chance to explore at least one of them if not more. Experience the humbling atmosphere of the monasteries and discover small monastic cells dug directly into the rock itself. Continue by visiting the 10/11th-century Byzantine basilica of Virgin Mary at the town of Kalambaka and gaze at the impressive frescoes covering its walls. Finish your day by enjoying the sunset at this idyllic location and make some long-lasting memories! You will be given plenty of time to take in the stunning view and take as many pictures as you like! Since we always put your satisfaction at the heart of our tours, it is up to you to decide where you want to stay for longer based on the time left and the timetables of the Monasteries. Meteora is a word originating from the ancient Greek word μετέωρος (meteor, meteorite, etc. relate to that word) which means lofty or elevated. They are a group of imposing rocks, reaching a height of over 300 meters, with steep, vertical smooth walls. During the 9th century, early-Christian monks chose Meteora as their place of seclusion and asceticism. Due to the inaccessibility of the site alongside with the existence of the pilaster-like rock formations, Meteora quickly came to be the second most important monastic Eastern-Orthodox community after the monasteries of Mount Athos in Halkidiki. The soft texture of the rocks helped the formation of numerous caves in the area. One of these caves is called Theopetra, some 4km away from the modern city of Kalambaka and constitutes one of the most important sites regarding human evolution! During excavations in the cave, archaeologists found evidence that shed more light on specific problematic time-periods of human evolution. Namely, they discovered evidence regarding the replacement of the Neanderthal occupation with the Homo Sapiens one, and evidence of the transitional period from hunter-gatherers to farmers after the end of the last Ice Age! The earliest findings of the cave date back around 130000 years ago! We've booked the tour but due to an emergency, we won't be there on time. What should we do? In case you won't be able to be at the agreed meeting point issued on your voucher on time, please let us know in advance by sending us an email or call us on this number +30 694 207 0899. Absolutely! Our company provides transfer services to facilitate your trip to Greece and guarantee a memorable and relaxing experience. Please send us your personal inquiry at . The "Meteora Sunset Tour " is available as a private tour, in order to further customize your experience to fulfill your specific needs & expectations. Simply tell us your preferences in the booking form below.